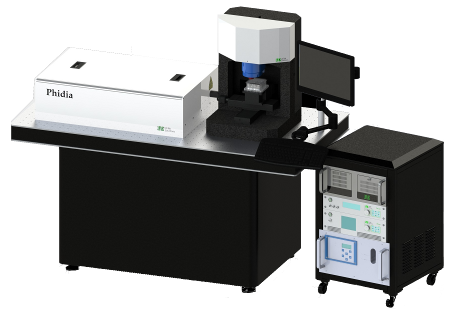 Sabray fs Micromachining System is a ultra-precision micromachining tools, which is mainly based on UpTek Solutions Corp.s Phidia femtosecond laser system, Spearay series laser processing module, German Scoroff high-end cabinet, and with the features of compact structure. Sabray is proven for high reliability and stability in industrial grade long time application. The 40fs to 100fs ultrashort pulse width and up to 5W output power from the Phidia enable the Sabray to process almost every type of materials efficiently. The marble base and gantry structure of the Spearay ensure the system very stable in processing. High moving precision and large scanning range of the translate platform provide extensive area for ultra-precision processing. As a powerful tool in the ultra precision processing field, Sabray can be widely used in the laser etching, surface treatment and 3D carving, touch screen ITO cutting, as well as metals, semiconductors, ceramics and other materials drilling and cutting. It is ideal for industrial and scientific users. 150 mm travel scale for XY-axis and 50 mm for Z-axis. The bidirectional repeatability is +/-2.5um at all XYZ-axis. 150 mm travel scale for XY-axis and 50 mm for Z-axis, with the unidirectional repeatability of +/-0.1um at all XYZ-axis. 160 mm travel scale for XY-axis and 50 mm for Z-axis, with the unidirectional repeatability of +/-0.025um at XY-axis and +/-0.05um at Z-axis.